That charitable act saved the club, and allowed it to continue bringing extremely high quality music to St Boswells. When the hall closed for refurbishment, St Boswells Live! played an important part in making the stage performance-friendly, and designing the lighting system that is now in place. The club moved away for one gig, but then moved back with an opening night featuring local legend Archie Fisher – the SBL! committee even played a few songs. Despite the hall looking great, the sound was suffering. With a sports floor and lots of insulation and double glazing, a big echo was inevitable – the new curtains helped quite a bit, but it was clear the creaking sound system had seen its day, and simply couldn’t cope with the demands of a big hall, complex sound mixes and old age (it comes to us all eventually). With this, and the desire to give something more back to the village, St Boswells Live! embarked on a fundraising effort and voila! in April 2015 the club was given £10,000 by Awards for All. 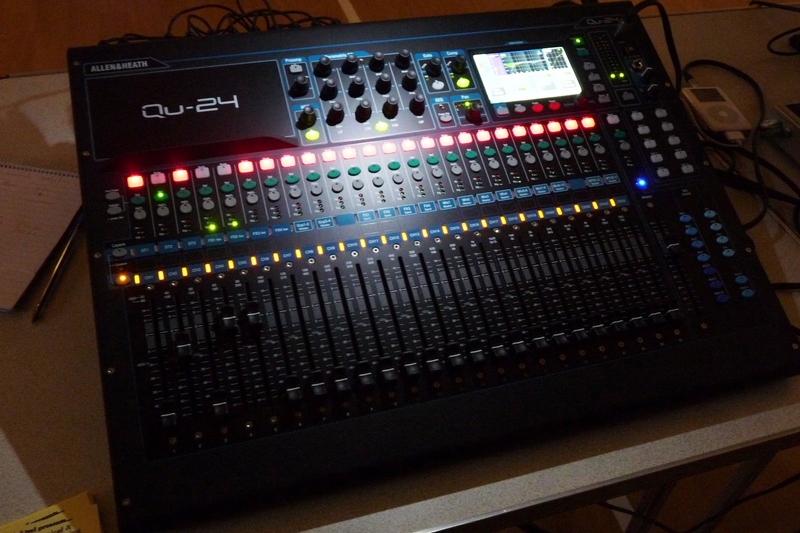 The new sound system was designed and installed by the same company responsible for the lighting, Black Light, consisting of a top quality integrated wiring system for signals and data, a state-of-the-art Allen & Heath mixing desk, and 2000W of QSC speakers fixed to the front of the stage.